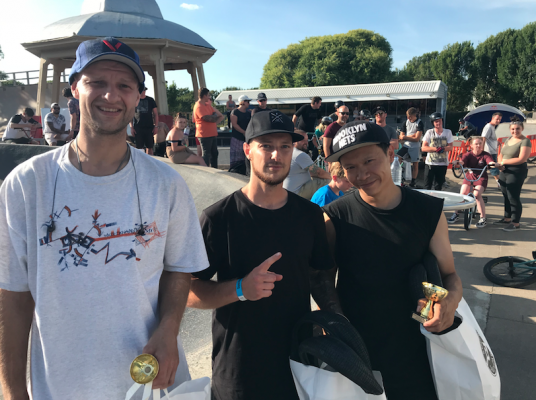 Flatmattersonline - Keelan Phillips & Johann Chan win King of Concrete! What a weekend at the King of Concrete at Southsea Skatepark. We have just celebrated our 40th anniversary in June and it was the ideal time to bring back a sleeping giant. Congratulations to Keelan Phillips who took the win in the Pro class and nice prizes courtesy of our flatland sponsors 4 pegs BMX and Kunstfrom, we didn’t have a great turnout for the Pro class so the expert riders jumped in and Johann Chan took the second place spot, followed by Paul Spychj who made a 33 hour bus trip from Poland to be at the KOC, amazing. Congratulations to Johann Chan who won the AM class and won a bunch of goodies including a much needed Ares front hub, Johann was followed by Mr Ride on himself, Neil Waddington with Mate’ Hocopan in the third place. Really happy with the turnout of 17 riders in the expert class, part of by intention with bringing back the KOC was to help grassroots grow, and so many Southsea locals enjoyed the flatland and got inspired which is what its all about! Once again I just want to send a big thats to all the riders, the judges James White and Lincoln Blcksley who helped me out with AM and Pro judging, the sponsors Four pegs and Kunstform! Same date next year, mark in your calendar!